Do you hear it? The leaves are changing colors and falling and the mountains are calling. One of the best fall break holidays is visiting the Great Smoky Mountains. Cool, crisp, clean night air, beautiful sunsets and places to get serene or party hardy. We’ve come up with our list of things to do during fall break in both Gatlinburg and Pigeon Forge. Whether you choose a Gatlinburg cabin rental or a Pigeon Forge cabin rental, you can’t beat the beauty that surrounds you. Sound like the perfect fall break? Read on. In its 9th year, Ober Oktoberfest is a celebration for everyone and is modeled closely after the original one way back when in Munich, Germany. There’s live music, an outdoor Bier Garten, outdoor games and more. Area restaurants and breweries get involved with providing Bavarian inspired food and beer. Plus, there’s plenty of souvenirs to pick up-beer steins and the like-to take back with all those memories! Think of all the sing alongs and photos that will end up on Instagram! The celebration starts on September 21 and ends October 28. Location: Ober Gatlinburg in downtown Gatlinburg at 1001 Parkway. Check out the Oktoberfest website for more details. For those seeking some downtime spent browsing through lovely art and listening to live country, bluegrass and gospel don’t miss the 41st annual Craftsman Fair. There’s over 180 artisans, artists and craftspeople from all over the country to show off their wares. Plus, many actually create while you’re there-pick up a personalized piece of pottery or a sculpture. It’s one of the top 20 events in the southeast and it runs from October 6-23, 2018. Located in the Gatlinburg Convention Center at Traffic Light #8, 234 Historic Nature Trail. Read more from their latest press release here. There’s no guarantee that you’ll get some paranormal activity or get to snap a photo of a ethereal being, but it’ll be fun trying. There’s three top contenders for this activity in Gatlinburg that are sure to satisfy the macabre in you. All highly rated on Trip Advisor. First up is Ghost Walk of Gatlinburg where a local storyteller dressed in appropriate costume takes you down deserted streets at night regaling you and your friends with ghostly, historical tales. This one takes about an hour. 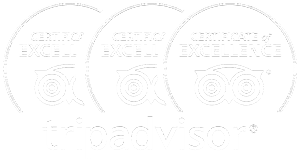 For a more detailed tour and Trip Advisor’s Certificate of Excellence Winner, check out Ghost & Haunt Tours of Gatlinburg. Touting the only company to have “real” ghost equipment, you can also go on a private van tour if you want to experience the paranormal with only close friends. Next, Appalachian Ghost Walk of Gatlinburg shows off all the places where other-worldly beings still linger, including settlers, Indians and celebrities. When is the last time you took an old-fashioned hay ride? You can during the fall and through the streets of Gatlinburg. Beginning November 1 through the end of December, hop aboard at Traffic Light #6 at the Mountain Mall. The rides leave every 45 minutes. Take a drive to Cades Cove Riding Stables to take a hayride or ride horses. What better way to breathe in the fall in the Great Smoky Mountains. “Indulge your unbridled spirit” while making one of the best lifetime memory with friends or family. Avid and novice golfers know how exhilarating it is to play on a crisp fall day. Golfing among the gorgeous fall foliage in the Smokies is even better. Visit Bent Creek Golf Course, a par 72 course that has a mountain stream running through it, making it as its claim to fame, “being both challenging and relaxing.” Located at 3919 E. Parkway. Visit their website. For those risk-taking fall breakers, go directly to Climbworks,. Rated the #1 adventure package place in Tennessee, you and your friends can zip line, mountain bike or white-water raft. Or, combine all three. All levels of experience! Tree top and mountain top zip lining and the trails you can ride are phenomenal. White water rafting may be a bit chilly during this time of year but it’s available if you are. Expert guides are there to take you to places you’ve never seen. Located at 155 Branam Hollow Road. How about a medium-bodied red to enjoy as the sun sets in Pigeon Forge? You can do that at Mill Bridge Winery in Pigeon Forge. The newest addition to Pigeon’s Forge charming historic district, it’s the perfect wrap-up-your-day kind of thing. The winery sits on the Little Pigeon River so get ready some for some colorful sipping with the Great Smoky Mountain fall foliage as a backdrop. You can also take a Rocky Top Wine Trail excursion. Start at the Mountain Valley Vineyards, then make your way down the trail that includes Pigeon Forge, Sevierville and Gatlinburg-five different locations. During the fall there’s a Chocolate wine tour! Check their website for more info. You read that correctly. At the Outdoor Gravity Park, you can dry zorb (roll around in a giant plastic ball) since it’d be too chilly to wet zorb, of course! Known as “good medicine” according to their website, it gets you away from all your tiny screens so you can observe the Smokies from a brand new perspective. But bring your cell phone because the photo ops are priceless! Just TRY to stop laughing. Located just down the road at 1949 Winfield Dunn Parkway in Sevierville, Scenic Helicopter Tours has generated 5-star reviews from participants. With 12 different aerial tours to choose from and budgets to fit just about anyone’s, there’s no better way to see the Great Smoky Mountains’ brilliant colors and curves. Goats are so cool people do yoga with them now. You won’t be doing yoga at Goats on the Roof, but you can grab up some campy goat swag, eat fudge, mine gems and get on a goat-cycle to deliver food to, you guessed it, real-live goats that graze on the rooftop. And, there’s a goat-coaster. How can you NOT go here? Visit their website for more info. Located off the beaten path at 1341 Wears Valley Road. Recommended for both areas-get outside! Have a picnic along a mountain trail. Bike along a mountain stream. Take in a sunrise or sunset with the colors of fall around you. Fall in the Smokies is unforgettable. Make sure you book the best Gatlinburg cabin rentals and Pigeon Forge cabin rentals at Condo-World. Call us or book online today!